Join us at our free Wednesday evening screenings of fascinating films with environmental themes. Followed by home-made cakes, coffee and discussion. 12th October The Economics of Happiness – Does Capitalism and Globalization come at a price ? 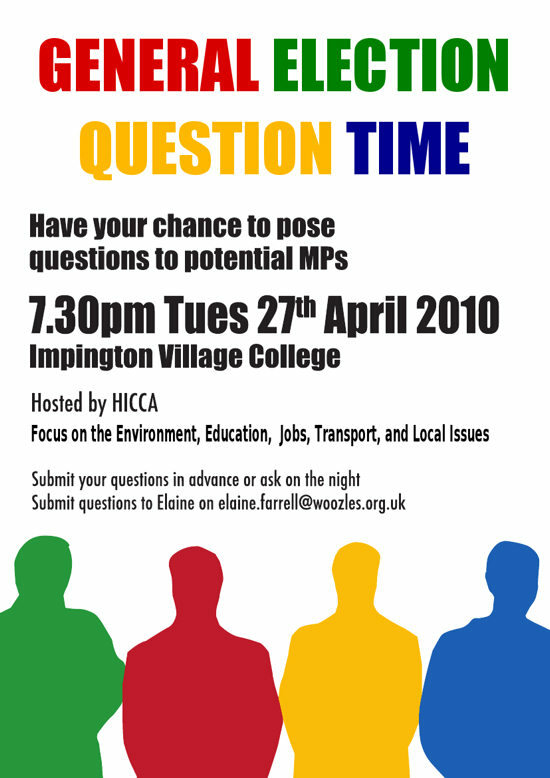 Book a seat by emailing Simon on films@hicca.org.uk or calling 01223 528212. Or just turn up! We are grateful for the support of St Andrews Church in allowing us use of the Stable Rooms, and also for funds and cakes kindly donated by volunteers and supporters. Donations (cash or cakes!) for future events welcomed. It is an enormous privilege to have Tony come and speak to our villages and I hope as many of us as can make it will turn out to hear him speak about his thoughts on politics after Copenhagen, his time at Friends of the Earth and his hopes as potential Green MP. Should be a great opportunity to meet Tony and question him on current environmental/climate change issues. HICCA members were in force at the WAVE climate change demonstration. Sarah, Elaine and Marine had created a fantastic banner for the march which will, no doubt, get many outings at future events. A lot of us travelled down together on the Coaches laid on by the Co-op. There were blue hands, faces and bodies as far as the eye could see in either direction, which was some feat for a chilly dayin early December. We felt that we needed to be at The Wave because the Copenhagen talks could prove to be such a defining moment in history. There were people from all ages enjoying the carnival atmosphere. There were people from all ages enjoying the great atmosphere. It is by no means inevitable that Copenhagen will see the fair deal that everyone at The Wave was calling for, but there was an undeniable sense of momentum as we rode the crest of our Wave past Downing St. and eventually engulfed the Houses of Parliament. It was a great feeling to be marching alongside 50,000 others from all walks of life on the largest climate change demonstration ever seen in this country. But the work doesn’t stop here. There’s plenty more campaigning to do during and after Copenhagen if we are to sustain the pressure on our politicians to make them take the radical steps that are needed to avert climate chaos. 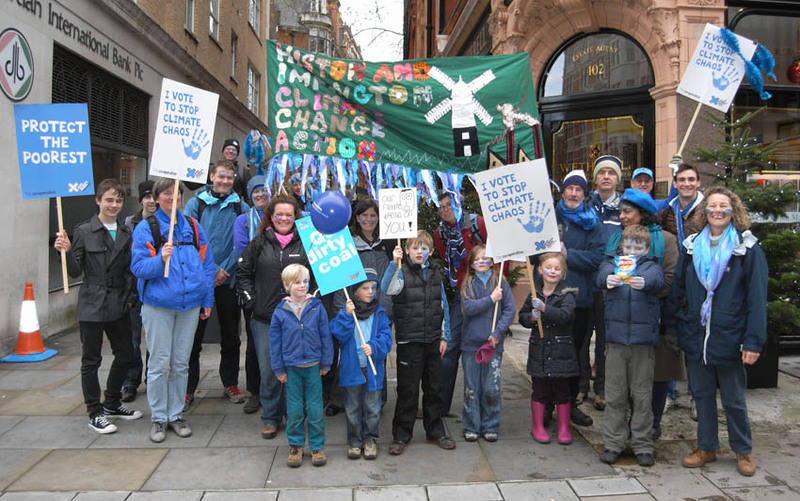 The Wave, on Saturday 5 December, will be a carnival style procession through the streets of London to call for international action on climate change. 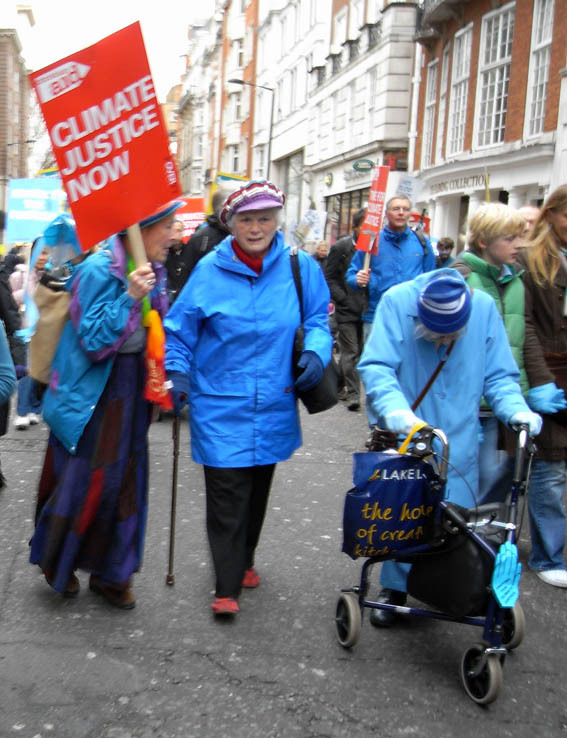 It is being organised by the Stop Climate Chaos Coalition, which has been organising peaceful climate change marches since 2006 to keep the pressure on government for definite action on climate change. The route will flow from Grosvenor Square, via Piccadilly and Whitehall, to finally encircle the Houses of Parliament on both sides of the Thames. Quite a number from HICCA are already booked on the coach leaving at 8:30 from Queens Rd, Cambridge. So book a ride for just £5 and join us on the march. Look out for the brand new HICCA banner! Organised by South Cambs Sustainable Parish Energy Partnership in collaboration with HICCA. Hundreds of households demonstrated support of the Greening Campaign by putting the card in their window. Residents of Histon and Impington are invited to join HICCA at Impington Village College on Wednesday 23rd September to discuss how to build on the carbon cutting success of the Greening Campaign earlier in the year. The meeting, which will include a brief AGM, will be conducted on the lines of the initial Greening Campaign meeting, with plenty of opportunity for interaction and discussion. Doors will open at 7.15 and the meeting will begin at 7.30 pm. 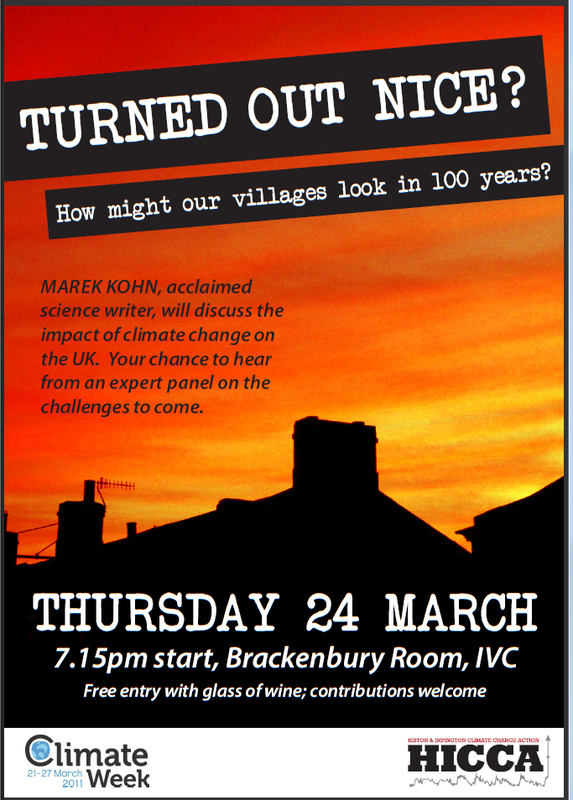 How Green Were Our Villages? announced on Histon Village Green at noon! It’s been an exciting month for the Greening Campaign but now the reckoning has begun as volunteers walk the streets of Histon and Impington counting up cards in windows. When the numbers are finally in, the amount of carbon (or carbon equivalent) saved through the actions villagers have pledged to do will be added up and represented in a balloon release. The Greening Campaign is an initiative where the community pulls together to reduce its impact on Climate Change. 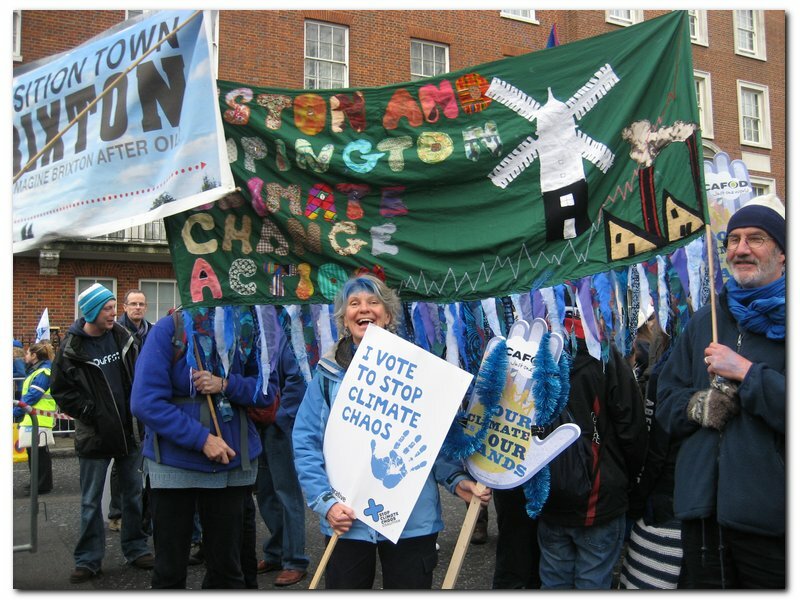 The campaign began in Hampshire and was so successful that since then many other villages and towns across the South of England have started to address the problem of reducing their CO2 footprint. Histon and Impington are the first villages in Cambridgeshire to take up the challenge. Villagers have decided on a list of 10 easy actions to cut their carbon; these actions have been put on a card, which have been delivered to every house in the village. Now residents have ticked five actions, and have displayed their card in a street-facing window. Now the cards are being counted and by Saturday the amount of carbon saved will be added up and announced. There’s barely a street in the village that doesn’t have a house with the distinctive leaf logo on display; in some those without are in the minority. 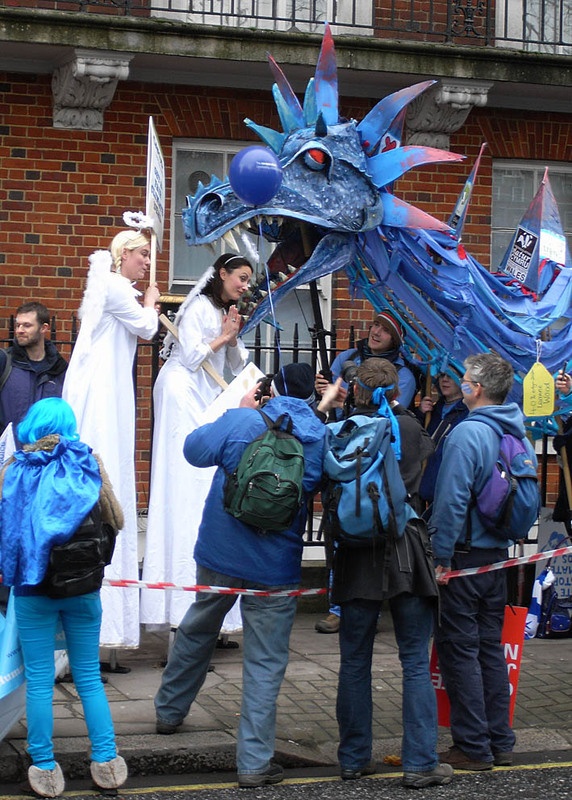 The Campaigners have held stalls outside Tescos, run a village greening fair, posted movies on YouTube and have worked with schools, faith groups and village organisations to achieve this remarkable show of commitment. For more information contact Steve Waters on 01223 237790 or email slwaters@btinternet.com. next Monday, and so this weekend is the last chance to get the cards up in windows. the campaign to those who haven’t quite ‘got it’ yet! info@hicca.org.uk or 503417 and I can arrange to get you some spare cards. you’ve been meaning to read up on the issue, this is your chance.